This government has become an absolute shambles and a joke … what a farce. Julia Gillard once again called for a leadership ballot – Thank God she won – she is easily the most detestable, monotone hateful lying SOB in the history of western governments. It’s going to joyful to watch her and her lousy ALP party sent to the desert for 20 years. Do I dislike her ? What gave you that impression!!!! If the Labor MP’s had any brains or forethought, they should have pushed Crean into the leadership. He would have drawn the “line in the sand” wound parliament up and called an election straight away. Its not a case of Labor being able to win the election, but limiting the losses. Crean has no direct connection to either of the previous PM’s and could have broken the link and swept the decks clean. Instead the Labor MP’s have chosen to go down with a sinking ship that has trashed the brand for the next decade. My real worry is the opposition goes all wishy washy on us when they get into power. Removing the carbon tax is one thing, but they need to trash all other “climate change” programs, and get rid of the climate commission. I can’t believe this government. I keep thinking it’s as bad as it can be, then it goes and gets worse! 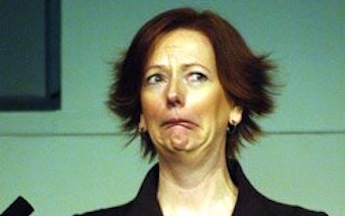 when Gillard took Rudd down the way she did, I thought wow, what are we in for? A woman in the house and leader of it, hmmmm I can imagine now that the guys in the house will be to scared to disrupt any thing she says, as most guys are pretty easy going , including our politicians, this time they would not want a woman telling them they are anti woman. I have been married 3 times and my other 2 ex wives were like Julia Gillard, great house keepers, Julia is not going to give up the house without a fight. It seems this is what is happening and every one I talk to about the labor part has swung towards the liberals even my wife and I, my misses thought that Julia was trying to get the woman’s vote 2 or 3 weeks ago and said to me, no way am I voting Labor, they have lost me.